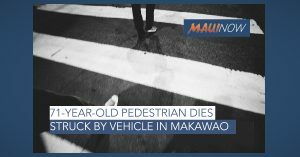 A 71-year-old male pedestrian died, after he was struck by vehicle in Makawao on Saturday night, police said. His name is being withheld pending notification of next of kin. The collision occurred as the man was walking on the makai shoulder of the roadway and was struck by a vehicle traveling westbound, according to police reports. Police say the vehicle failed to stop and fled the scene prior to police arrival. The vehicle involved was located by police shortly after and the operator, identified as a 66-year-old Pukalani man, was placed under arrest and later released pending further investigation. Police say the vehicle was found parked and left unattended fronting a Pukalani home. The male pedestrian was transported to the hospital in critical condition but later died according to police reports. The incident was reported at around 7 p.m. on Saturday, Feb. 9, 2019 on Makani Road east of Mokuahi Street in Makawao. The roadway was closed for about three hours as police conducted an investigation. This was Maui County’s fifth traffic fatality for 2019 as compared to one at this time last year. It comes just hours after a pedestrian accident in Kīhei . Police say the 22-year-old pedestrian in the Kīhei accident has since succumbed to his injuries and died.